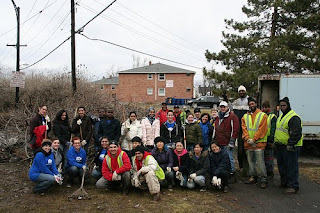 Pictured: UB students spending their spring break cleaning up the Heights neighborhood. For the third consecutive year, the University at Buffalo has been nationally recognized for its community service in areas of volunteerism, service-learning, and civic engagement. The award is a collaborative recognition from the Corporation for National and Community Service, the Department of Education, HUD, Campus Compact and the American Council on Education. Recipients of the award are chosen based on a compilation of factors including the scope and innovation of service projects, percentage of student participation, and the incentives provided by the school to participate in service-learning programs. UB qualified for the honor roll due to their free tax preparation service that returned almost $640,000 in tax refunds to low-income families, the Center for Leadership and Community Engagement’s “Saturday of Service” program that paired students with Habitat for Humanity twice a month, UB’s free medical clinic on the city’s East Side that provided health care to over 1,500 Buffalonians, and the Community as a Classroom program that taught inner-city students how to use their educations to positively impact their neighborhoods. Overall, approximately 4,700 UB students along with hundreds more faculty and staff provided the Western New York community with an estimated 323,000 service hours. Well done to all of those who contributed to this esteemed effort!